Astronomers regularly study supernovae to gain knowledge of neutron stars and formation of black holes. Neutron stars that continue their collapse can become black holes. On one particular observation of type 1a supernovae, they didn't appear to be as bright as they should have been. For years astronomers thought they had made errors and other matter could be interfering with their brightness like gas, dust, atmospheric conditions etc. Different and independent astronomers came to the same conclusion. The universe is expanding and the expansion is accelerating. The laws of physics say that if you throw a stone in the air it slows down, stops and falls back down again. This discovery would be like throwing a stone in the air and instead of it stopping it speeds up and escapes from you. This was met with controversy and is still contentious in astrophysics circles. The name given to this mysterious matter accelerating the expansion - dark energy. Edwin Hubble first proved the expansion of the universe when Einstein believed the universe was static and everlasting. He called this his greatest blunder. Hubble calculated that the universe was expanding at 71km per second per megaparsec and is taking stars and galaxies with it. A megaparsec is 32 million light-years or so. There's one mind blowing thing we need to discuss. When far away galaxies emit light the light travels through space to reach us and the further light travels it becomes red. This is called cosmic redshift. Light fights the expansion of space to shift into the red zone. Using Hubble's expansion rate and the Hubble space telescope we can look many many megaparsecs into the universe. So 1 megaparsec = space expanding at 71km per second 2 megaoarsecs =142 km per second etc. The expansion of space is taking the galaxies that are embedded into it with it as it expands. So if we peer deeply into space at around 4200 megaoarsecs then galaxies will be moving away from us at the speed of light and any further than that then galaxies are moving away from us faster than light! Before everyone starts to complain, this is possible. The speed of light is the speed limit for things travelling THROUGH space, so space itself is exempt from this rule. We can look at galaxies that are moving away from us faster than light as they were closer to us when they emitted their light. 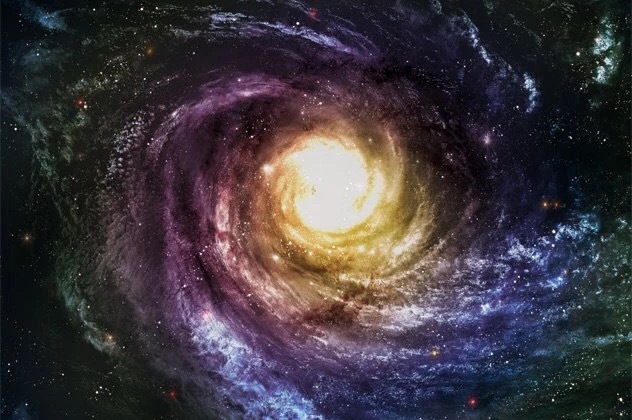 In pounds sterling a galaxy that is 13.7 billion light years from earth is moving away from us faster than the speed of light and the redshift of the light can be detected. So can dark energy be overcome? The short answer is no. It is just too powerful. There just isn't enough matter in the universe to slow it down or stop it. So on that note, the universe will expand forever taking all the galaxies with it. In billions of years if humans are still around there will be nothing but our own galaxy when they look at the night sky as all the galaxies will be so far away that their light will never reach us. So enjoy the night sky and take as many notes as you can. We only have around a trillion years left to have the night sky we have now.